The top pics are this summer – 9 stone 2. Bottom pics – today 7 stone 13! Lost 6 inches overall. The gym bottoms only just fit at the start and now I have to tie them up as they are quite loose. I feel sooooo much better!!! I hit my target weight of 8 stone over 2 week ago and have maintained since. 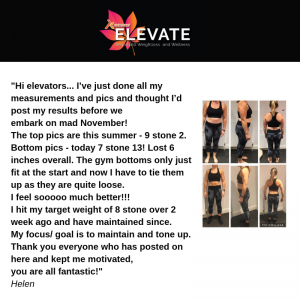 Thanks for sharing Helen and well done! Do you want to join us for November? Click here we start 5th November!